If you’re planning on visiting Mexico during the holidays, you will be sure to come across the traditional Nativity scene. Although Christmas trees and other decorations can be seen in Mexico, the most iconic decoration during the holidays is the Nativity scene. These scenes portray the birth of Jesus and can be extremely ornate. In temples and churches, the scenes are especially large and impressive; some even employ live actors to recreate the parts of Mary, Joseph and others. It’s also traditional to leave the manger empty until Christmas day, when baby Jesus is placed inside. The first Nativity scene was created approximately 800 years ago by St. Francis of Assisi, the founder of the Franciscan order. He was inspired to create a living recreation of the birth of Jesus during a visit to Greccio. The idea caught on and spread throughout Italy and the rest of Europe, and over time models were created to replace live actors for Nativity scenes within the home. During the time of the Spanish conquest of the New World, Nativity scenes gained added importance. They were a useful method of explaining religious concepts to natives as the figures could transcend the language barrier. Centuries later, Nativity figures still play an important role in the culture and even economy of Mexico. Many cities are involved in the manufacture of Nativity figures: the angels of Tzintzuntzan, Michoacán; the clay figures of Metepec, State of Mexico; figures from Ameyaltepec and Tollman, in Guerrero; painted miniature figures from Tlaquepaque, Jalisco. 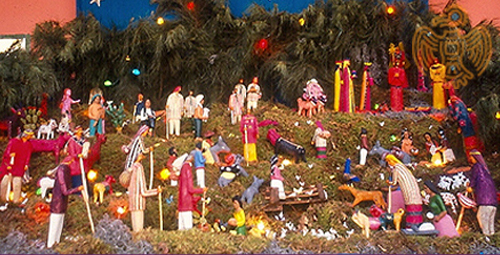 Mexican Nativity scenes present a unique mixture of elements. In addition to the standard figures of Mary, Joseph, the Wise Men and baby Jesus, figures representing traditional Mexican roles are also quite popular. This means that a Nativity scene may proudly feature characters like water boys, bakers and postmen, among others. They’re also accompanied by an odd mash-up of plants, from cacti to pines, and various kinds of animals make an appearance. From time to time, the Devil himself is represented in the Nativity scene; he takes a number of forms, but the most common is a red figure with black wings. Some scenes even incorporate lights and synchronized music. If you visit Mexico this year during the holiday season, be sure to keep an eye out for Nativity scenes in public places, churches and around people’s homes. Mexico City, Guadalajara, Guanajuato, San Miguel de Allende, Puebla, all create beautiful public displays. Nativity scenes throughout Mexico range from picturesque and majestic to chintzy and absurd, and all of them embody both the spirit of the holiday and the soul of Mexican culture.